We will organise a tour to the mushroom province of China, Yunnan, in 2012 following the ISMS Conference (International Society for Mushroom Science). Click here for more info. Following the opening of the Wageningen University Centre in Zhangzhou, we made a study tour to many different mushroom farms and medicinal orchids. Fujian Agriculture and Forestry University is quite impressive, especially the JUNCAOtechnique which was developed by prof. LIN Zhan Xi. The temperature in the room was difficult to control, most mushrooms emerged in the front of the installation, the colder back part is now starting. 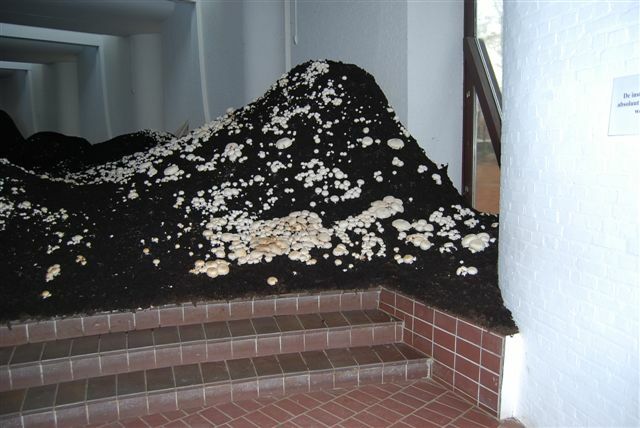 Zeger Reyers, also known as the Mushroom Man in the Dutch cultural scene, was invited to exhibit in the famous Middelheim Art park. He convinced the management to load some 45.000 kilos of spent mushroom compost in a white brickstone monument. Actually, the lady from the monument commission was the least of his problems. A first load of compost was dead and started fouling. He had to clean the whole lot and some 25 people (including me) used Chinese methods to get all the materials in the building. He built a landscape with dunes which are covered with black casing soil. 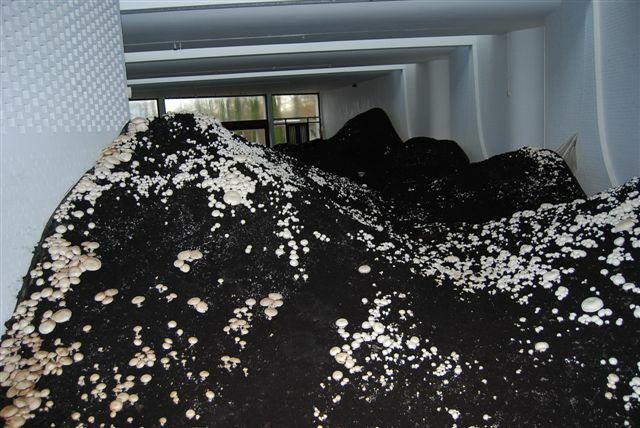 In a few weeks, the black dunes have to turn white with growing mushrooms. Jiangxi Science and Technoloy Press will print and distribute the Chinese version of the book Mushroom Cultivation, 3rd edition. Mrs YE Cai Yun, official translator of the Jiangxi Institute of Technology, worked very hard to translate the book and find a publisher for it. Pilzforum produced substrate for the in Europe unknown mushroom species Pleurotus ferulae, of which EC Consult brought a culture from China to Europe. One block of substrate yielded 3 mushrooms, in total almost 1 kg from a block of 2,5 kg. In 2003 verscheen de derde druk van dit handboek, dat een compleet overzicht biedt van alle aspecten van de paddenstoelenteelt. Een belangrijke distributeur naar ontwikkelingslanden was CTA in Wageningen, dat voorlichters uit Afrika bedient met een brede range aan boeken.De uitgever, Backhuys Publishers, onderzoekt of hij een vierde ongewijzigde herdruk uit zal brengen. Vanuit China is interesse voor het boek, het is ondertussen vertaald en zal naar verwachting begin 2011 op de Chinese markt verschijnen. In Afrika wonen meer dan 170 miljoen mensen die Swahili spreken, maar niet of nauwelijks Engels of Frans. Een contact van Agromisa heeft het paddenstoelenbekje vertaald en vijftigtal exemplaren aan de minister van Landbouw van Tanzania verkocht.